Local Artists Berkeley is designed to help cultivate growth for the arts in Berkeley. We strive to enrich the lives of the public, beautify the city, inspire the youth, and assist artists to become the professionals they are working hard to be. Local Artists Berkeley and Adeline’s Lab have collaborated to host Handmade, an exhibition of individual artists working in the crossover of art and craft. All artists are part of the community at The Crucible, a nonprofit arts education program in Oakland, California, where skill sharing and collaboration occur daily. Often working in close proximity with each other, each artist contributes to a history of craft as a community oriented practice. Their creative authority combined with technical skills associated with their materials have brought their artwork into boundaries of what is considered fine art, craft, or perhaps both. Curated by Ana Azzue Gallira. The Bay Area has been a melting pot of social change, environmental activism and a mecca for the arts for quite some time now. The culture here is as diverse as the characters walking the roads. The beauty of the buildings and the rhythmic sounds of the music echo through the streets of our loved neighborhoods for our rich communities. Now that the tech boom is blossoming out across the waters of the Bay, gentrification is rising faster than the ocean levels. The once colorful streets are becoming more and more drab with the many pedestrians staring at their phones, not the gorgeous architecture, not the beautiful murals, not the buskers playing melodic tunes on the sidewalks. With the steady rise of rent, the once affordable rundown buildings are now being bought and sold to companies who are kicking out the creative tenants that once turned these ruined sights into labyrinths of artwork and sound. More and more of our artists are being forced from our homes to seek refuge in foreign cities. Little by little they are being pushed further and further, even to Canada in one scenario witnessed by a co-founder of LAB. This is why we need to work hard, to keep our Artists here, to keep our streets colorful. Berkeley is one of these places that has been going through some changes. Just in the year that Local Artists Berkeley has been alive, we have already seen a few great artists, patrons of our colorful community, leave to find affordable living elsewhere. We need to help support our fellow artists and their ability to create beautiful and magical art for us. LAB’s true mission, besides bringing art to the streets for the people of our City, is to help support our artists, our friends, our families. We want to help young and upcoming artists. Feed hungry artists, and help support their careers to help keep them in our community. This is our paramount goal. We need to include these struggling artists and build them up as they build up our equity in our loved City of Berkeley. Our artists give so much of themselves to the people, they lay everything they have on the line to be able to create their dreams and follow their hearts. They create because they have to create. They deserve to live happy creative stress free lives as they intrust their exposed inner feeling to us all. We must work together, to bring Inclusion to all of our artists. Not just a select pedigree that the many people in power want. But to open the doors, open the streets to allow art in our lives and feed these artists that work so hard for us to enjoy our walks through our streets. Local Artists Berkeley needs your support to help make this happen. Lets build Equity in our City for our Artists. Let's show our appreciation for these artists by supporting their endeavors and supporting their livelihoods so they can stay here with us. Lets allow them to show their artwork and pay them accordingly. This is Inclusion, this is Equity. This is how we save our world. 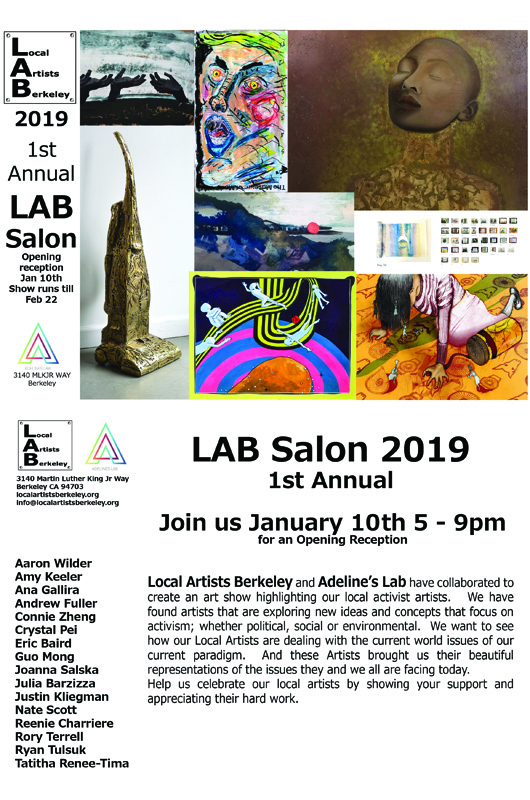 Please show your support by emailing us at info@localartistsberkeley.org or go to our website at www.localartistsberkeley.org to read more about us and donate if you can. Thank you Jon Jon for all the time and work you put into helping us with our screen!! The Grease Diner is the best!!! Now its time to start making some t-shirts!! CALLING ALL BAY AREA ARTISTS!!!! and ART LOVERS!!! We have permission from the Civic Arts Commission to move forward with our Pilot Program, YA!! So we are planning to install 2 sculptures this Fall. Please check out our website, submit a proposal via our form, and /or share to any and all artists you know in the Greater Bay Area. Local Artists Berkeley will have a booth set up at this years Maker Faire Bay Area!! Keep an eye out for us, we will be near the Grizzle Sculpture "Ursus". 2018 will be an exciting year for us; we are ironing out all the detail of our pilot program to create a sculpture art walk that will help to facilitate further growth within our arts culture. The integration of technology with all sculpture sites will allow for the public to be able to voice their opinions of the artwork in their city and also help to bring creative feedback to the artists that are giving the pubic a part of who they are. Some benefits to the artists include a worthy stipend for the 12 month loan of their artwork. The City of Berkeley’s requirements for engineering, insurance, and permitting are too much for most mid-career artists. Local Artists Berkeley will be covering these costs, and those of the installation and de-installation.